Westboro's Trevor McNamara has the Rangers poised for a deep tournament run. 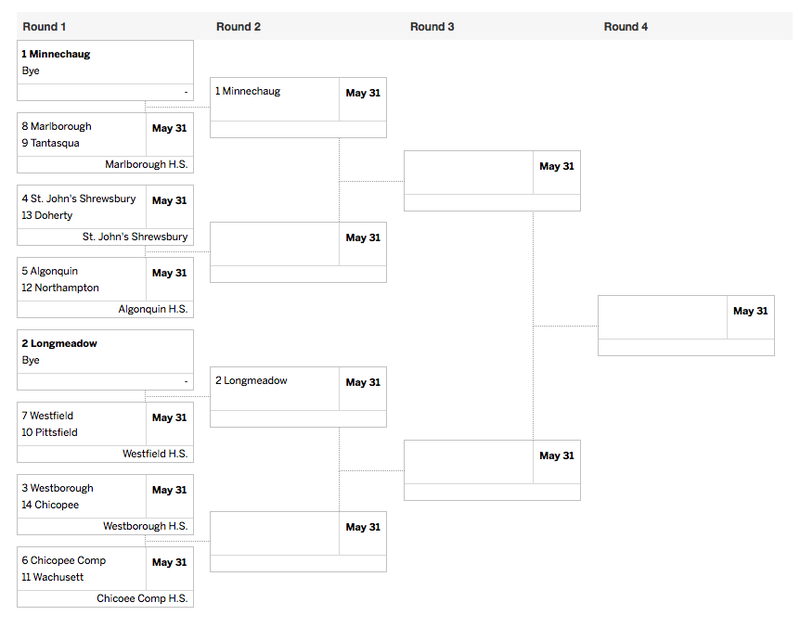 As we expected, seven Central Mass lacrosse teams will take part in the Division 2 Central/West bracket, and it looks like we're going to get some CMass-vs-CMass action early, as two first round matchups pit regional teams against each other. Here are some quick takeaways from the D2 CW bracket. No surprise here. These two Western Mass powers have been ahead of the pack all year, with Minnechaug knocking off both St. John's and Algonquin by a combined 16 goals, and defeating Longmeadow earlier in the season. As for reigning D2 C/W champ Longmeadow… Well, the Lancers are the only team to beat Minnechaug, scoring a victory over the Falcons in a rematch earlier this month, and with All-American Max Stukalin back in the lineup, Longmeadow has rattled off five straight wins to end the season, including a dramatic victory over St. John's. All that said, this district should be the state's most compelling, and it's because nobody would be surprised to see one of these three teams emerge from the bracket. Westboro has only two losses all season (both to league foe Algonquin), and the Rangers are riding high on a six-game winning streak, culminated by a win against D3 power Grafton. Led by junior attackman Trevor McNamara, and underrated goalie Jeff Bernard, Westboro quietly claimed our top spot in Central Mass for the regular season. St. John's, meanwhile, has played one of the most brutal schedules in the state, and comes into the tournament a battle-tested 12-6. The Pioneers have played Longmeadow, D1 EMass powers Xaverian and BC High all to the wire, and scored impressive wins over D1 playoff team Mansfield, D3 state title contender Grafton and Algonquin this season. St. John's has been as good as ever offensively, with attackman Drew Kozub picking up the scoring slack, and senior middie Andrew Cox doing a little bit of everything. True, the Pioneers have a few head-scratching losses, but it's tournament time, and St. John's should be emotionally up for every game. Finally we come to Algonquin, a team that doesn't have timing on its side. The T-Hawks are in a funk, coming into the tournament losers of four straight, including losses to Wachusett and Shrewsbury teams they had previously defeated. Another bit of bad timing is the wrist injury that All-American middie Mike Martens is battling. Martens, a senior, sat out Algonquin's regular season finale against Grafton, but says he'll be back for the tournament. How effective will the region's premier face-off taker be with a potentially broken wrist? Well, he probably won't be handling duties at the X, but Gonk could certainly use his savvy as a passer and scorer. 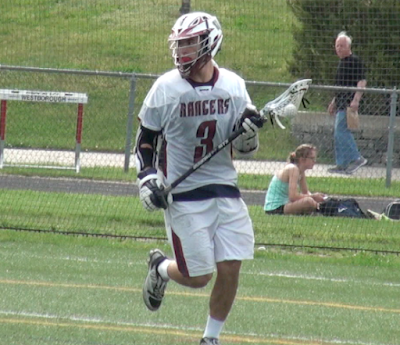 Even if he isn't full-go, Algonquin has talent up front, where attackmen Zack Skowronek and Matt Cannon have emerged, and a defense led by poles Justin Leva and Mike Tascione, along with star goalie Colton King should keep the Tomahawks in any game. Like St. John's, Wachusett has a couple losses on their resume that concern me, but one thing is for sure: The Mountaineers can score. Led by Dan Turgeon, Mike Fritschy and Griffin LaPosta, Wachusett tied Westboro for the most goals per game in Mid-Wach A, and even when the Mountaineers weren't winning, the kept pressure on opponents by lighting up the scoreboard. Westfield is another team that can score in bunches, as the Bombers scored in the double-digits 12 times this season. Westfield has been slowed against better competition, such as Minnechaug, Algonquin and Longmeadow, but the Bombers still have the potential to pull a tournament upset. 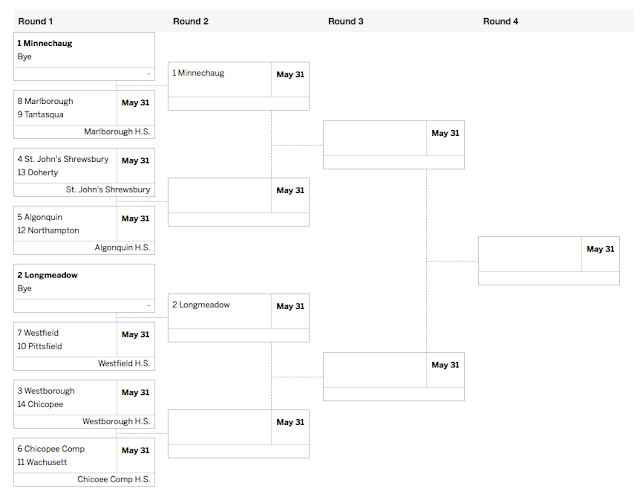 Just ask Longmeadow, Westfield's potential second round opponent. WooLax will be making its third consecutive tournament appearance, and the Warriors have won a playoff game each of the last two years. Keeping that streak alive will be a tall task, however, as Worcester draws St. John's away in the first round, then would face a potential matchup with Algonquin in round two. For those who forgot, Worcester opened the season at St. John's and fell 11-1. Now, Worcester is as physically tough a team as you'll come across, and the Warriors have come a LONG way since then, so don't count them out yet. But, any team that had to go through the two premier programs in Central Mass just to make the semifinals would feel a little slighted. The bracket does neither of these teams favors either, as two of Central MA's most explosive teams meet in the first round. If they weren't facing each other, I'd peg both of these teams as potential dark horse candidates to make a deep run. Instead, we should be treated to a really fun game Tuesday in Marlboro. The host Panthers can score with anybody, led by Ryan Mechler, Jason Plaunt and Dom Carter, Marlboro ran away with the Mid-Wach C title and averaged a region-high 14 goals per game. Tantasqua, meanwhile, has come on strong behind the junior attack trio of Mike Frio, Ben Beaudry and Anthony Law. The Warriors come into the tournament riding a six-game winning streak, and have scored in double-digits the last eight games. Expect a ton of points and some back-and-forth action, as two teams that finished strong look to make the second round. I think Wachusett caught a little bit of a break. Sure, they have to travel to Chicopee Comp, but how did Chicopee Comp come out of the seeding as a number 6? In the only game they played against a 90+ Laxpower team, they got beat by 8 (Tantasqua). Looking at their schedule, I didn't see any quality wins, whereas Wachusett is battle-tested in Mid-Wach A. If they get through, not having to play a 1 or 2 in second round is a plus for Wachusett. Agree that Marlborough playing Tantasqua should be a fun one to watch in Round 1. Marlborough came back from 7 goals down against St. Johns to tie it up with 30 seconds to go, losing by a late goal, plus beat Shrewsbury with a statement second half. They look ready to go and firing on all cylinders. Tantasqua playing a Mid-Mass schedule plus a lot of Western Mass teams makes for a tough comparison on this one...that's why they play the game.